Kitchener – Kitchener-based construction firm Gateman-Milloy brought home three awards from the Grand Valley Construction Association’s (GVCA) Building Excellence event on Friday, April 29, 2016. The firm was awarded for its work on Innisfree House and the BMX Supercross Legacy Project for the 2015 PanAm Games. It also earned recognition as a Community Builder for its charitable work on Innisfree House. The GVCA’s bi-annual event invites submissions for construction excellence in industrial, commercial and institutional projects from member firms across Ontario. The organization also awards excellence in restoration or conversion projects as well as innovation. New for 2016 is the Community Builder award, recognizing excellence in corporate social responsibility; Gateman-Milloy is one of the inaugural recipients of this award. Gateman-Milloy invited industry partners, subcontractors and suppliers to join in the construction of Innisfree House – Waterloo Region’s newest palliative care hospice – either through in-kind services or product or price reductions. In addition to financial support for the project, Gateman-Milloy also provided its Construction Management Resources. and medical support; halls and doorways were designed to permit residents to freely move in, out and around the building, creating the ease of a home-like setting. In addition, Innisfree House offers a library and light-filled spaces for living, meeting and dining. The lower level features a flexible meeting room with a moveable wall, as well as a practice suite, which is used by nursing students, staff, and Board Members. Innisfree House is situated in a naturalized setting on a sloping site. The change in grade elevation allows for access and parking at both levels of the two storey building. Gateman-Milloy’s work on Innisfree House was also awarded in the Institutional $2 to $5 million category. 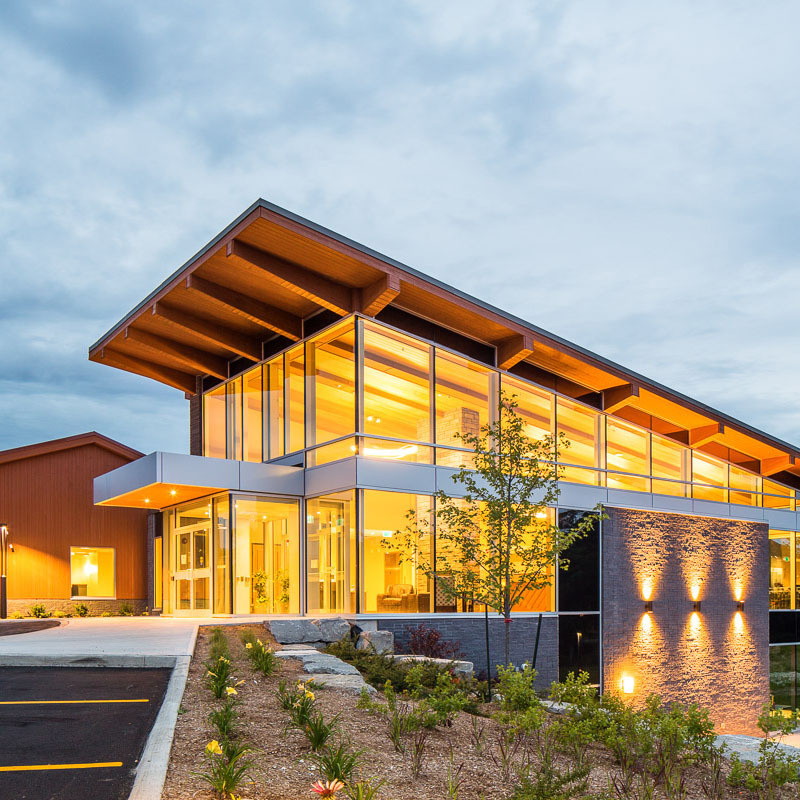 The 16,200 square foot palliative care facility was constructed on a three-acre site in Kitchener directly across from Conestoga College’s Doon campus. The location was chosen with the intent of providing nursing students the opportunity to learn end-of-life palliative care. Attention to budget is critical in any project, but when the budget relies on charitable donations there is even greater pressure for fiscal responsibility. On the Innisfree House project Gateman-Milloy was able to adapt original construction plans to find efficiencies and save critical donation dollars for other uses. The team also worked closely with the client to ensure that construction features made the facility feel more like a “home” and less like an institution. Construction of BMX Supercross Legacy Project (above) for the 2015 PanAm Games also earned Gateman-Milloy an award for building excellence in the Commercial $2 to $5 million category. The 517 meter closed-loop track is reputed to be the premier professional BMX course in the world. It covers 2.55 hectares of Centennial Park in Etobicoke and is the only track in Canada to be designed, constructed, and certified to Union Cycliste Internationale standards. Through its corporate social responsibility program, Gateman-Milloy provided in-kind donations to the Pan-Am Games Committee to assist with funding some of the innovative features of the project; the company was recognized as a “Proud Supporter of the 2015 Pan Am/Para-Pan AM Games”. “Together with their skilled subcontractors who worked diligently through all kinds of weather conditions, Gateman-Milloy delivered a high-quality, world-class venue for both the games, and a legacy for future BMX athletes and recreational riders for many years to come,” said Peter Didiano, Capital Project Supervisor for the City of Toronto.